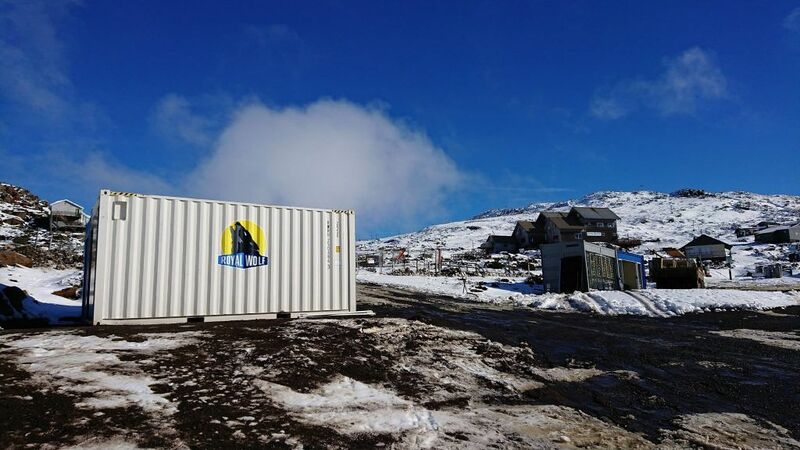 Royal Wolf saved the winter season for Tasmania’s skiers, after a fire at the Ben Alpine Hotel destroyed the resort’s main lodge and pub in May. With under two months before the busy winter season began, the venue’s owners had little time to revive the facility. Located at the top of a winding mountain road in the Tasmanian Wilderness, the Ben Alpine Hotel is difficult to access. Royal Wolf approached the hotel’s owners with a shipping container solution that could overcome the time and location challenges of the site. Seven modified containers were provided, including two outdoor rooms to act as bus shelters, three hoarding units for extra seating, a kiosk to serve food and drink, and one basic storage cube. Royal Wolf quickly sourced these from its Tasmania and Melbourne branches, and made the relevant preparations before they were moved on site. Each unit was carefully transported to the top of the mountain by truck and secured in place. The installation was executed in a few days, and the whole project within five weeks from start to finish. This left more than enough time to avoid the harsh weather and the start of the ski season. The outdoor rooms house up to 20 people and feature wooden floors and heating facilities to keep customers happy. These have allowed regular shuttle ski services to continue in the area’s most important resort. The kiosk has allowed Ben Alpine to continue its food and drink sales despite losing its pub, helping to minimise lost revenue. Clayton Bevis, senior sales executive at Royal Wolf said his team were thrilled they could revive the only resort in the area and allow thousands of skiers to enjoy the snow. “The Ben Alpine hotel plays a vital role in the local community, and we look forward to seeing it restored to its full glory,” he said.